The COASTAL project is managed through eight work packages (WP), each of which oversees and/or are responsible for various parts of the four-year project. This is illustrated in the chart below. To view project outputs and deliverables, please go to Resources. Push interdisciplinary collaboration beyond the state of the art towards an actor-driven, iterative, and bottom-up approach with generic, qualitative tools which are developed in collaboration with the sectors, stakeholders, and administrations. The general objective of WP2 is to develop the quantitative data and scientific model constructs needed for synergistic analysis of the rural-coastal interactions identified in WP1. These need to be translated to the appropriate level of detail that is required for strategic business and policy analysis. The tasks of WP2 are based on the outcomes of the conceptual analysis of the coastal-rural feedback dynamics analysed by coastal and rural stakeholders, actors, and researchers in the Multi-Actor Labs. The general objective of WP3 is to design and evaluate evidence-based business and policy solutions aimed at improving land-sea synergy in EU coastal regions (Project Objective 3), and translate the outcomes into strategic business road maps and policy guidelines (milestones MS6 and MS8). These take into consideration the mid- and long-term social-economic transitions, changes in driving forces, and non-linear dynamics resulting from the system complexity with an impact on the coastal-rural interactions, including the positive and negative (economic) externalities of business and policy decisions. They support policy-makers, business entrepreneurs and other local actors with evidence-based decision making. COASTAL adopts an interactive Systems Dynamics approach for supporting business decisions. System Dynamics or SD modelling is widely used since the 1950s for problem analysis in applications ranging from logistics, control management, engineering and financial management to public policy. Clients and business analysts interact design Causal Loop Diagrams. These are graphical models explaining the underlying dynamics of the problem - resulting from the combination of reinforcing and balancing feedback mechanisms. Quantification of the CLDs allows for further analysis, such as the pinpointing of 'tipping points'. Typical questions answered are: why do certain businesses fail and others not under similar circumstances? Why do certain management strategies work on the short term, but not on the long term? Although the human brain is capably of providing part of the answer this becomes more difficult when multiple factors play a role. This is certainly true for complex social-environmental systems such as coastal regions which are densely used and rapidly developing, with economic activities competing for resources such space, water, and skilled labor. A tutorial example was demonstrated during the project kickoff meeting, showing the interaction between tourism, pressure on space and the attractiveness of a coastal region for new tourists. Limiting the total number of tourists can be necessary to avoid economic collapse of tourism. The true strength of SD modelling lies in the transparency of the graphical models, enabling interactive design and use of the models, the limited data requirements and high computing speed. The objective of WP5 is to develop scenarios and transition pathways for coastal and rural development, and translate these to the case study level for supporting the business and policy analyses by WP3. Understanding the role of uncertain exogenous drivers, key system parameters and structural changes of the system is crucial for developing robust business and policy strategies and developing solutions which maximise the resilience of the system. The scenarios quantify the uncertainties in the mid- and long-term trends of the future social-economic, physical, and technological conditions affecting coastal and rural development (e.g. world energy prices, market demands for agricultural products, climate change, sea level rise, or population growth). The scenarios are then applied in the System Dynamics (SD) modelling ( WP4), contributing to the robustness of the business road maps and policy guidelines developed by WP3. The transition pathways are goal-oriented descriptions for the different transitions towards sustainability, exploiting innovative business and policy solutions aimed at coastal-rural synergy. WP3 and WP5 closely interact to formulate generic transition pathways, and adapted to the context of coastal-rural synergies. The transition pathways are compared with the SD model simulations generated in WP4. The outcomes are used to validate the transition pathways and fine tune the SD model, in order to exploit the combination of qualitative and quantitative knowledge to the maximum extent possible, prior to the application of the transition pathways in WP3. WP6, which runs for the duration of COASTAL and beyond, deals with the external communication actions that address continuous multi-channel dissemination of project information, developments and results. 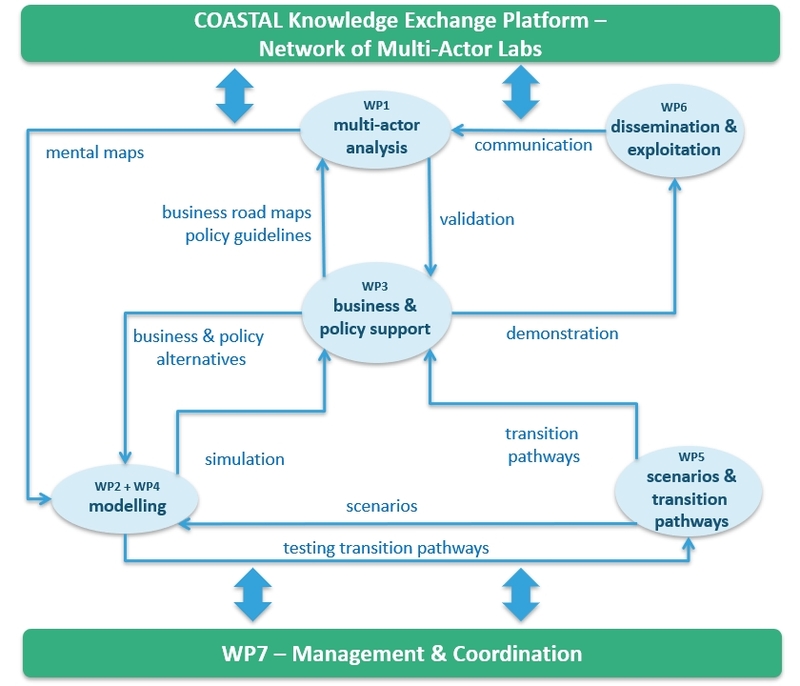 WP6 sets up a Knowledge Exchange Platform (KEP) (by Month 12, to support Multi-Actor COASTAL exchanges MS2) (coastal-xchange.eu) that will foster: 1) communication, aggregation and synthesis of individual findings in the WPs; and 2) communication of knowledge with stakeholders both during the project lifetime and beyond. In the post-project exploitation phase, a key component in the management and transfer processes to stakeholders and end-users will be the Knowledge Exchange Platform offering access to data, maps and model driven decision aids, designed to address the needs of stakeholders and end users. Communication activities include a clearly structured, well-designed and up-to-date website, networking with relevant projects, and the production and dissemination of project videos, posters, leaflets etc, as well as technical and scientific articles in magazines and journals, using Open Access (OpenAIRE) for boosting impacts and effective dissemination of key findings. COASTAL is committed to a genuine transdisciplinary process, reflected in consortium composition of stakeholder and scientific partners, and the emphasis on multi-actor engagement. The project coordination and management is designed to support and actively facilitate the implementation of the COASTAL project in this way. WP1 coordinates activities to ensure the COASTAL project meets its objectives on time and within budget. It manages and monitors the evolution of the project, facilitates communication with the partners and the European Commission, organizes and facilitates project meetings, administer contributions from the international COASTAL advisory board, partners, and MALs. This technical workpackage that sets out the "ethics requirements" (POPD, NEC) that the project must comply with.